There are many questions that I answer in asp.net forum. Here is/are some of them. In such case, you compel your members to view the private page. There are several other options but it is one of the basica. Best of luck. Require https to safeguard Windows Authentication credentials? It is strongly recommended that the loginUrl should be an SSL URL (https://) to keep secure credentials secure from prying eyes. But all these things are applicable when it is only Forms authentication, The Windows operating system has a role system built into it. This Windows security group system is an ideal system to use when you are working with intranet-based applications where you might have all users already in defined roles. This, of course, works best if you have anonymous authentication turned off for your ASP.NET application, and you have configured your application to use Windows Authentication. Again I come back with an old issue : Forms authentication. Now in a Matthew MacDonald and Mario Szpuszta book I found a very nice diagram which beautifully explains how forms authentication is activated. • You have full control over the authentication code. • You have full control over the appearance of the login form. • It works with any browser. • It allows you to decide how to store user information. 1. Configure forms authentication in the web.config file. restrict anonymous access to the web application. 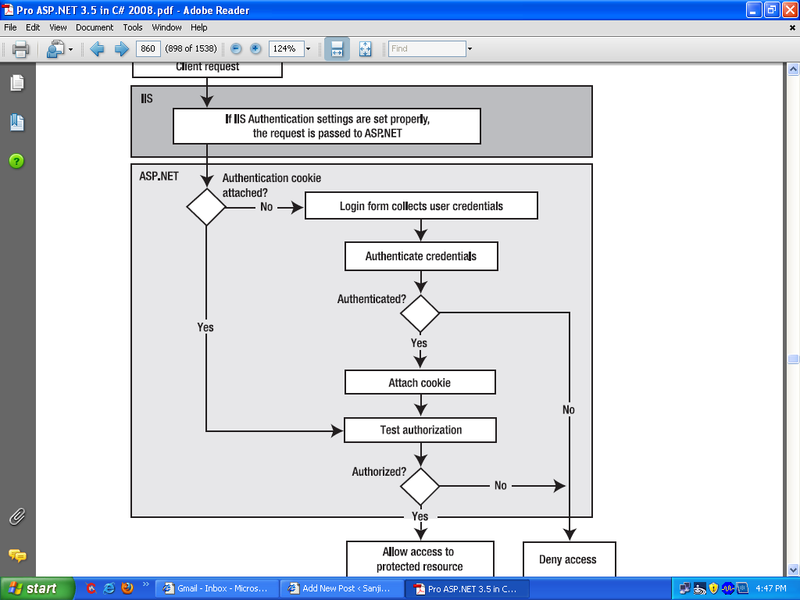 interacts with the forms authentication infrastructure for creating the ticket. This is the most basic part. After this step, you can create your own provider class in web.config, you can add profile to keep tracks of the users etc. But that is entirely other aspects. Actually, last day I spent some time over it and after some experimenting with my website, I’m going to write what I found. all the details of authentication and security. On the contrary The default authentication mode for ASP.NET applications is Windows, which is fine if you’re working in an intranet environment where every user probably has a Windows login for use in the corporate network anyway. Using Windows authentication, Windows itself handles all the security and authentication, and you can use the myriad of Windows utilities and functions such as Active Directory, to manage your users. The mechanism is, to use forms authentication and the SqlMembershipProvider, we need to create a database to authenticate against. This database will hold our user information, as well as membership information, so we can both authenticate the user and provide access based on membership in specific roles. What I’ve done, I created the database using aspnet_regsql.exe and later added it to my website’s App_Data folder. So that later it became easier to add other tables and establish a relationship between them. In fact going this way, I can reduce the volume of App_Data folder drastically. If one goes using Windows authentication, the App_Data folder takes more than 10 mb space. Instead if one uses Forms authentication, and in web.config uses membership provider then the whole scene changes quite interstingly. Obviously the connectionstrings will be changed accordingly. Using this we can take aspnetdb.mdf to App_Data folder and moreover add other tables accordingly. It is neccessary as there are some hosting companies who do not allow more than one database. I’m trying to understand Forms authentication, membership classes….